One thing I love about reading blogs is that I come away with lots of ideas. I saw a photo of chicks in a laundry basket at the Kitchen’s Garden, so when it came time to transport some incubated chicks from our flat to our garden, I looked no further than our mesh laundry basket with a Velcro closure. At Garden to Wok I have discovered new vegetables to grow (I have Red Noodle long beans this year) and how to grow them (I now plant all my bok choy in groups of three, a sort of short cut succession planting). I could go on for weeks. And of course there are recipes. Many times, I have found the answer to the perennial question of what to cook in blog posts like Squishy Monster’s soybean rice or Lois Elsden’s soda bread. A good friend of mine living in Abu Dhabi often points out interesting blogs for me to read and it was through her that I began to follow the blog Rachel Eats, written by an English woman living in Rome. And one day she posted a recipe for spaghetti al pomodoro – spaghetti with tomatoes. I shuddered. Let me explain. I went to a high school in Rome for three years, the first two and a half years as a day student, and as a boarding student for my last semester. (I did my senior year in Istanbul.) I am not sure how often we were served spaghetti with red sauce, but it was often enough that the mere sight of it was enough to move me to tears of dismay. I am sure that cooking for hordes of sullen teenagers is a joyless affair, and I mean no slight to the brave efforts of the kitchen staff, but I remain deeply averse to spaghetti with tomato sauce. Still, I read on and found myself willing to try the recipe. It was so simple sounding. Could tomatoes, garlic, oil and a little basil really become something to write about in such luminous terms? I made the sauce, using the requisite indecent amount if olive oil (I poured it in until my heart began to pound), tossed the pasta in straight from its cooking water and watched a sauce emulsify on the noodles, like magic. I was serving it alongside something else, but as soon as I began to eat the pasta, I forgot about everything else on the table. Then I forgot about the table itself and everyone around it as I ate the pasta and it took me deep into my own thoughts. The velvety slick of sauce was perfect and beautiful. How foolish I had been to doubt that such a simple recipe could be so good – when it is the right season, tomatoes will shine as brightly as they are permitted. Best of all, it took pasta with tomatoes and dragged it out of the school cafeteria once and for all. The recipe is here. Treat yourself. 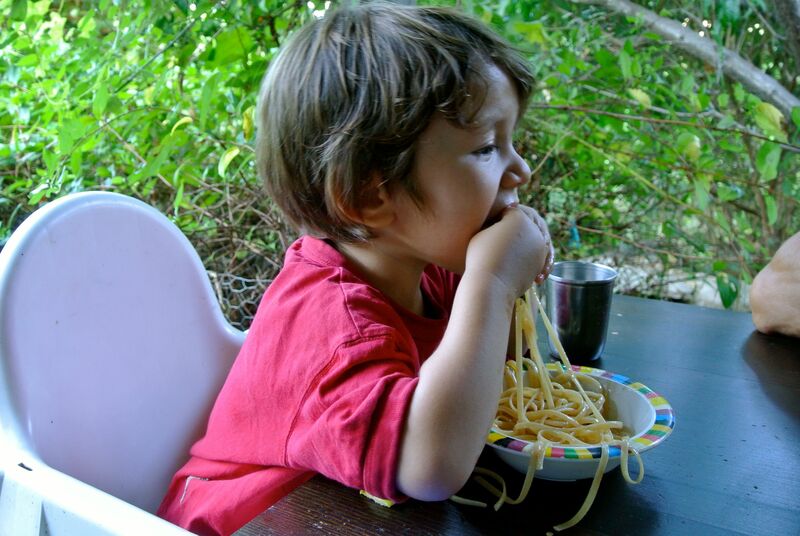 Nothing makes this mother happier than seeing kids stuff their faces with spaghetti. The chicks are huge! I’ve been enjoying watching how your lot are growing, too. Right back at you, birthday girl! School food has a lot to answer for! I didn’t eat liver for years, until I realised how delicious it is when it’s cooked properly as opposed to be cooked until rubbery and then held in an enormous serving tin for an hour like they did at school. Felt the same way the first time I made ‘real’ Alfredo sauce – no cream, no gloppy texture, just pasta water, oil and butter, and parmesan. Sublime…Can’t believe I’ve never done this – so simple and yummy! It’s on the menu for later in the week! That really does look like a very good recipe. I just ‘followed’ her blog, and I thank you for heading me off in that direction. I hope that autumn is treating you and your lovely family well. I’m so pleased! We are more waiting for Autumn than enjoying it at the moment, but I’m ready for the rain… and I can’t wait for sweater weather! Great recipe and so simple. Thanks for the mention. Did you get lots of red noodle beans? The vines gave lots of beans but I was a bit timid and didn’t plant enough of them. I won’t make that mistake again! They freeze well. I cut the noodle beans into shorter lengths, blanch for 3 minutes, cool, drain and freeze in meal-size portion.